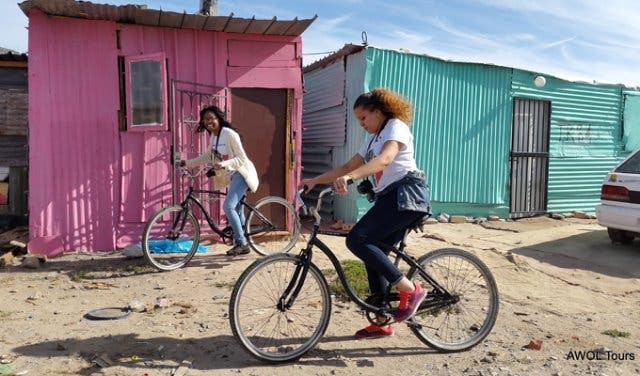 Are you looking for a unique township tour in Cape Town? Have you ever wondered what happens at a township church service or what an African traditional healer actually does? You’re not alone, and to answer these questions and many others, AWOL’s founding member and Director, Sally Petersen, started bicycle tours in Noordhoek’s township of Masiphumelele on the Cape Peninsula to provide guests with the unique opportunity to interact with the local community and learn more about Xhosa customs, from a bicycle seat. 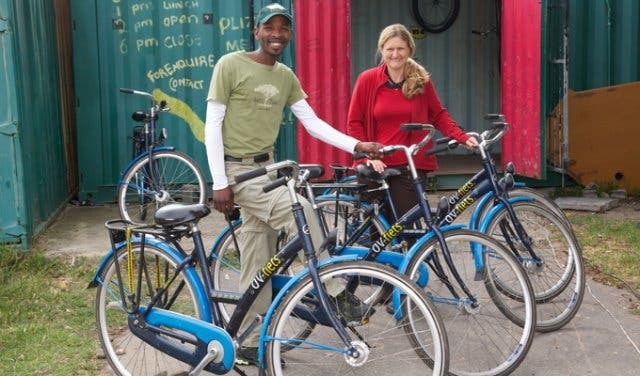 A responsible tourism initiative in conjunction with the Bicycle Empowerment Network (BEN), the award-winning tour promotes the use of bicycles as a form of low-cost transport and as a way to facilitate access to employment and education for locals. On the day I join the excursion, our tour group is nice and small – my partner and I, plus a family of four, start the morning by chatting away to our friendly guide, Zwai, as we make our way along Masiphumelele’s dirt tracks to the bicycle shop, a space stocked with imported, second-hand bikes and operated by local residents. One of the first things I notice is a striking mural, which graces the walls of one of the containers. “This was painted by the children,” Zwai explains proudly. In fact, all of these containers make up an entire youth complex comprised of a sewing centre, a small church, an arts and crafts centre and the bicycle shop itself. We are each handed sublime, old-fashioned bikes with long, curved handle bars that you have to pedal backwards to brake. After a rusty start (it’s been years since I’ve ridden a bike! 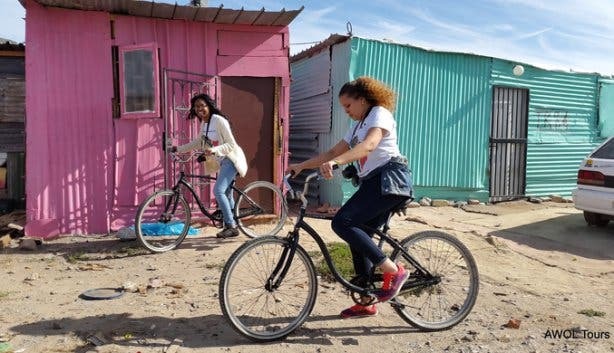 ), we are soon cycling through the streets of Masiphumelele with nothing to separate us from the shacks, houses, dirt tracks and local people. I already feel part of the experience. Our first stop is a Sunday church service, and we can hear the rumble of gospel beckoning from within. We take a seat at the back and observe throngs of people of all ages in joyous song, dancing and clapping with such energy. When the church leader orders everybody to shake hands with or hug the person next to them, we are no longer voyeurs, but have folded into this scene. The congregation’s members are shaking us by the hand and offering warm embraces. “I know you,” one woman says to me, “You have a familiar face.” I don’t believe in God, but I’m smiling. I can’t help it. I glance around and the rest of the tour group is too. Our second stop in the township of Masiphumelele is the home of a sangoma (an African traditional healer). This is where you come if doctors can’t heal your ailment – it doesn’t matter whether your illness is physical, emotional or spiritual. We sit down on the wooden benches that populate the low-lit, bare room. A woman sits in a corner with a drum, and a young traditional healer emerges (the traditional healer’s daughter). “Welcome,” she says. She is wearing an intricate headdress with tassels, which she tells me took a full day to make. Her ancestors spoke to her and told her to make the headdress in the colours of red, blue and white. It is these beads that let her know when someone is coming, and thanks to her ancestors, she already knows what is wrong with a person before they tell her. The bells on her feet act as a drum when she dances to evoke her ancestors. Our third and final stop is Charlotte’s Place – a small, but cosy shack that Charlotte shares with her granddaughter, Tamika. We huddle in and sit in her living room, sipping on welcome cups of tea and nibbling on delicious chunks of vetkoek (a deep-fried roll). Charlotte recalls her childhood: her mother was a domestic worker for an Israeli family in the wealthy Cape Town suburb of Tamboerskloof, so Charlotte grew up in a large house, dining on mussels and herring, and playing with children from a local boarding school. 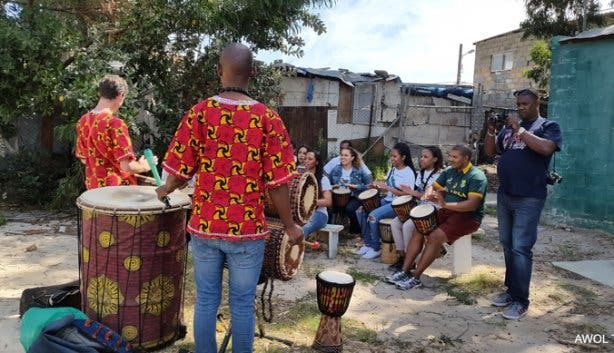 When the Israeli family left, they bought Charlotte’s family a house in Mitchells Plain to thank them for their hard work. Charlotte explains how now, in Masiphumelele, she faces many hardships. But despite everything, she would never leave because she loves her community. It’s a community that shares, a community that demands better education for all and a community that campaigns to empower its women. In 2008, Masiphumelele was even awarded the annual Reconciliation Award from the Institute of Justice and Reconciliation (IJR) in recognition of its efforts to live in peace with foreigners and resist violence. And only after a short two-wheeled tour through this vibrant area I can understand her wishes. Masiphumelele is truly an incredible place, and so before you think of typing ‘Xhosa customs’ into Wikipedia or driving with your camera pressed against the glass of an air-conditioned bus, think of taking a bicycle tour here instead. This great day tour is fully interactive and opens your eyes to age-old Xhosa customs and the township spirit of togetherness. It’s a unique opportunity to say: ‘I was there’. 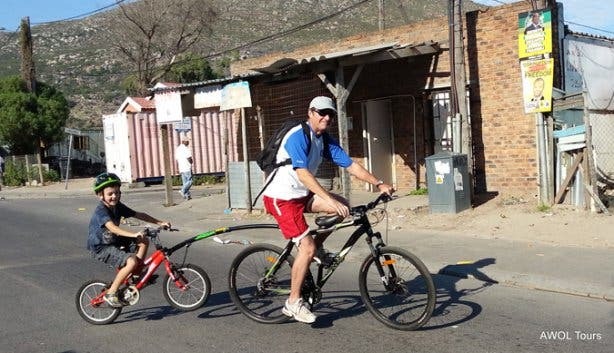 Bicycle tours in Masiphumelele commence every day of the week, throughout the year. 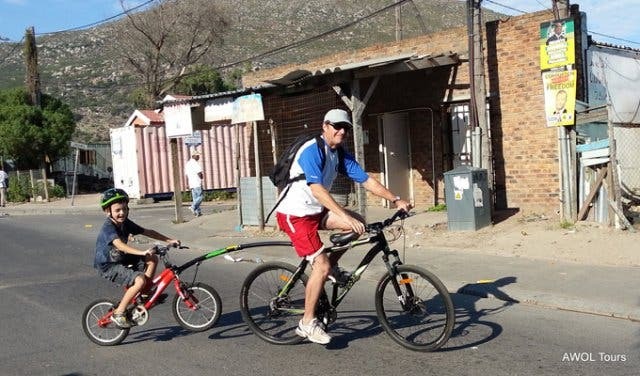 Half-day Township tour is from R950 per person, min two, excluding transport. Half-day tour including transport is R1850 per person, min two, including transport. All tours are private, so you get a personal experience and are not part of a huge group. You can either drive to Noordhoek yourself, or AWOL tours will organise a pick-up for an additional R400 per person. The tours include a township guide for a half day, a driver guide for a full day, old-fashioned Dutch bicycles, a church visit (on Sundays only, replaced by art classes at Masivelani crèche during the week), drumming and dancing by a traditional healer, an optional braai at Nongoloza’s Butchery and the chance to donate towards Masivelani crèche, for the betterment of their facilities. AWOL tours offer a vast variety of expeditions and adventures that vary in price. For more info you can visit www.awoltours.co.za. Bookings and payments can be made online via a safe and secure payment service on AWOL’s website. Want to know more about the cycling and hiking expert? Read more about AWOL's Peninsula Cycling Tour and City Cycling Trip offering.